Before undertaking any repair it is essential that your damp problem is assessed by a qualified surveyor for failing to have the problem diagnosed accurately may result in unsuccessful repair, avoidable work, expense and the risk of the problem returning. Is your damp surveyor qualified? We provide professional and credible damp and timber reports which are only undertaken by experienced and fully qualified surveyors who hold the National Qualification for remedial surveying C.S.R.T. awarded by the BWPDA / PCA, our industry body. This proves that our surveyors have been independently examined and tested, proving their extensive knowledge and expertise. All of our surveys are carried out in accordance with The British Standards Code of Practice. Our damp surveys involve a thorough external inspection of the property to identify any potential defects with the damp proof course, ground levels, rainwater systems, drainage and other maintenance issues. An internal inspection is undertaken to the walls of the property by means of non-destructive electronic testing using moisture profiling techniques. If our surveyors require the need to carry out detailed disruptive inspections in order to further asses any problems, we will, of course, ask your permission prior. Our surveyors carry all the necessary diagnostic and inspection equipment onsite, including thermal imaging and fibre-optic cameras to examine hidden cavities, highlighting blockages and bridged damp proof courses. Salt analysis testing and equipment for in-depth moisture analysis of masonry walls and plaster is also available. Photographic evidence of our findings is recorded and included within our report, so you can be sure of correct diagnosis. Our reports contain comprehensive advice of any problems identified and include our recommendations, specifications and costs for repairs, if necessary. Edited pictures along with category damage ratings are also included to assist your understanding about the urgency of any repairs needed. Our reports are available in both printed media and/or converted into secure electronic Portable Documents (PDF) for email. Dryfix use an array of different repair methods and treatments for resolving damp issues ranging from water repellent sprays to physical membranes and diffusing gels. Our surveyors will specify the safest and most effective method of treatment for your circumstances favouring a holistic approach to repairs and minimal impact to your property and environment. All products we use have been independently tested for their performance by the British Board of Agreement (BBA) and/or approved safe for use by the Health and Safety Executive (HSE). Dryfix repairs are only carried out by experienced tradesmen and qualified remedial technicians who have been independently trained and accredited by the BWPDA / PCA, our industry body. The majority of building materials used to construct your home are porous, which means they can absorb moisture. When a modern home or building is constructed a barrier is installed into the base of the walls and floors to prevent moisture from the ground being absorbed into the building. This is known as a damp proof course or membrane. Its purpose is to either repel or physically prevent the movement of moisture upwards through the building. Rising damp occurs when moisture from the ground is absorbed up into the fabric of the building by porous building materials - a process known as capillary action. This unwanted moisture can then deteriorate the masonry, timber floors, internal decorations and joinery. Not all buildings have a damp proof course. Many old properties constructed in the early 1900's did not have damp proof courses installed into the walls and floors during construction, leaving them vulnerable to the rising damp phenomenon. Some properties constructed after this time with early damp proof course designs such as; slate or bitumen felt also suffer, as these designs often failed due to poor practice, design or material. Now building regulations and advanced understanding of materials and practices should result in the problem of rising damp in recently constructed properties becoming a problem of the past. 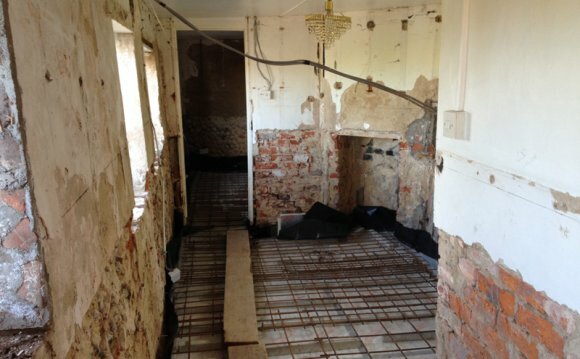 However for many older properties still suffering from rising damp, a modern technique of installing a retrofit damp proof course has been developed, tried and tested. Rising damp can be recognised in a number of ways; decaying skirting boards and/or floor timbers in contact with walls, deteriorating and/or salty plaster or rendering, discoloured or peeling internal decorations, often with a dark wavy tide mark appearance, can all suggest a rising damp problem. If you recognise any of these symptoms it is essential that you contact a qualified surveyor to correctly diagnose the problem and propose a repair. When rising damp occurs, salts within ground water migrate in solution into the walls and plaster. These salts aggressively attack the plaster and may appear on the face of the wall or plaster as a white powdery crystal. These salts can be hygroscopic which means they have the ability to absorb airborne moisture. Where salts are present, it is essential that replastering is carried out to remove the salt contaminated plaster. If contaminated plaster is left, these salts may prevent the wall from drying due to their hygroscopic effect, continuing to give the appearance of an ongoing damp problem. Be wary of any damp proof system or contractor who states that replastering is not essential, without justification. We have specialist equipment which can be used to detect the presence of these hygroscopic salts in walls and our surveyors can remove samples of plaster for specialist laboratory testing if required. This may reduce the overall extent of replastering needed, in some cases. Fortunately it is possible to rectify the problem of rising damp without rebuilding your home. Modern chemical, electrical and physical barrier systems exist which can be installed into an existing structure without too much disturbance. By far the most common system is a chemical water repellent liquid or gel. Typically this will involve drilling a series of application holes around the base of the walls too allow for the installation. Not all remedial DPC systems are suitable for all types of construction, therefore it is essential that the correct system is chosen for the construction material to ensure successful treatment. All products we use for the treatment of rising damp have been approved by the British Board of Agreement (BBA).